Visit the pages below for dates, locations & information on our upcoming 2019 educational events. If you are on Facebook, be sure to join our group! The EEM is a tradeshow with a vendor floor & schedule of classes taught by many different instructors. Embrilliance is a proud sponsor of this event and will have a booth in the vendor area. 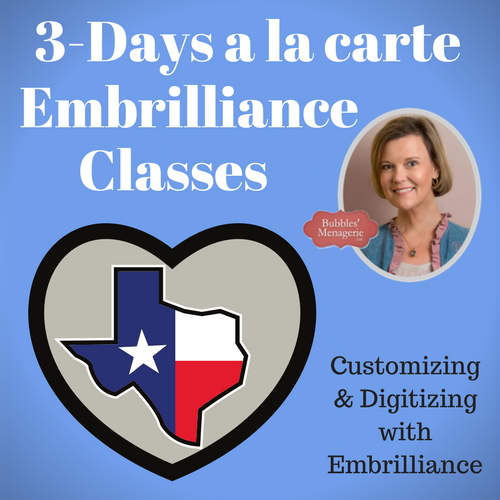 Lisa is teaching “pre-show” hands on Embrilliance workshops as well as Embrilliance seminars during the event itself. The schedule & registration for all workshops & seminars are done through the EEM website link above. Additional dates and locations will be added as soon as details are finalized. To be notified of locations and dates, please sign up for my newsletter – be sure to add Sew-Bubbles.com to your safe sender list so that the newsletters arrive in your inbox.